Are You Harming Your Tree By Pruning Them Back Too Much? 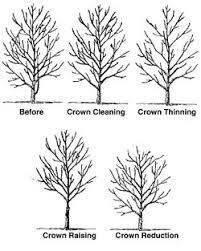 Crown Reduction reduces the size of a tree, often for clearance for utility lines. Reducing the height or spread of a tree is best accomplished by pruning back the leaders and branch terminals to lateral branches that are large enough to assume the terminal roles (at least one-third the diameter of the cut stem). Compared to topping, reduction helps maintain the form and structural integrity of tree. Topping is the practice of cutting the main branches of a tree down to a stub. It damages the tree by causing weak, yet rapid growth sprouts to grow. This destroys the trees shape, weakens it, and makes it much more susceptible to diseases and rot. Topping your trees too far can add to trunk and root decay, rapid growth, poorly attached limbs, and future damage. The practice of aggressive tree pruning or “topping” is still popular today, even though evidence shows that it is a bad practice. Sidewalling is the practice of trimming all of the branches trimmed on one side to keep branches off of a property resulting in a stressed tree with too much foliage removed, causing too many large wounds and direct sunlight on the exposed bark. Our approach is more holistic and less stressful for the trees. Our practice of pruning less than 25% of the leaf surface of the tree in one growing season promotes tree vitality and is healthier for the overall profile of the tree. An expert Arborist knows how and what to trim, removing dead wood, crossing and rubbing limbs, or clearing for houses, walkways, utility lines and other safety hazards. Call today for a tree pruning estimate or to learn more about proper pruning techniques.